One of the critical ingredients in creating the added value which Madoff Securities offers its clients is the firm's intricate interweaving of advanced technology and experienced traders. 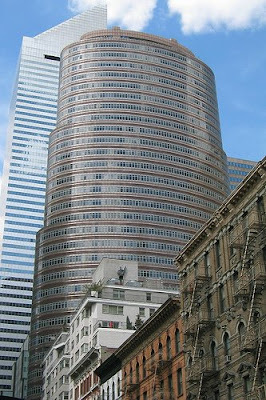 The firm's position at the forefront of computerized trading is widely acknowledged in the US financial community. According to the criminal complaint Bernie Madoff made off with $50 b's of other people's money thru The Perfect Ponzi. That's a world record for a criminal charge. My movie about this will be called "The Owner's Name Is On The Door"
In an era of faceless organizations owned by other equally faceless organizations, Bernard L. Madoff Investment Securities LLC harks back to an earlier era in the financial world: The owner's name is on the door. Clients know that Bernard Madoff has a personal interest in maintaining the unblemished record of value, fair-dealing, and high ethical standards that has always been the firm's hallmark. Yesterday I wrote a discursive piece tipping The New York Times Company. By hideous yet happy chance I seem to be on the same wavelength as the management.Today they announce Times Extra which upgrades their front page to a 3rd party content aggregator. A small step, but significant. The Times has potential. It's America's best known journal despite treachery, disgrace and mismanagement and it's a major owner of the brand value of New York City itself. NYC has global recogniton approached only by London and Paris as a city of the imagination. Once the NYT figures out its global potential on the web, it could gain a massive boost to circulation and advertising. This little step today may prod the market to see NYTco as an internet growth play to own rather than a dead trees decay play to short. Price today - $8.10. Market cap - $1.16b. 1. Staring death in the face forces management to do what needs to be done. 2. There are ways the Dems can give taxpayers' money to the NYT without a straight bail-out. Job ads is one used by UK government and quangos to boost their favourite organ, the Guardian, which prints a weekly 100+ page supplement for jobs in social work and worse. 3. The NYT brand could become scintillating. There's excellent content and a vast archive. An imaginative editor would ditch the incredibly boring line up of commentators (does anyone enjoy reading Krugman, Brooks, Dowd, Herbert, Rich, Collins? Why not a line-up of Paglia, Kos, Coulter, Steyn, Carville, Richard Dawkins? People who people want to read. Make your own list. I'd call the commentary team ' The Galacticos' after Real Madrid's soccer stars. 4. The first internet bubble was predicated on the value of eyeballs. Eyeballs bring ads and more eyeballs and more ads. The NYT has quite a few eyeballs now, but could attract vast numbers more with a re-design and a think locally, act globally mindset for it's web business. 5. The NYT brand has been poisoned, but there's an antidote -run it as a newspaper rather than a propaganda organ for the eternally juvenile. Maybe now that Bushitler isn't around to shore up the liberals' religion, their energies will be freed to write about the world as it is. Or maybe the scummy propagandists will just go away. I'm not asking for a paper that agrees with me - tho a Paglia-inspired, Palin-loving NYT would probably become compulsory reading across the political spectrum - I'm asking for a proper wall between editorial and reporting, as well as truthful reporting, better writing, better design and a vision to attract a vast pile of eyeballs across the globe. 6. The sun will rise tomorrow. The biggest factor now in the stock market panic is fear of the unknown. When I read today that Obama positively proclaims that there won't be a windfall tax on oil companies, I thought this is proof that he's not insane. The rally of the last couple of weeks is mainly due to that realization as evidenced by his economic apppointments. An unqualified opportunist is ok, a Chavez-like nutcase would not have been a buy signal. Bombed out businesses like the NYT suddenly have a decent presumption of a Clintonesque administration and can bounce back hard. In the last couple of weeks I've loaded up on NYTco, GM, Genco and Xstrata.....the stinkiest stocks I could think of that I vaguely understand. Each is different, but each has been massively depressed by fear of the unknown. You read it here, Anatreptoids. NB these are all highly risky bets that can go to zero overnight, so you should only make them if you can absorb the entire loss or know how to control the loss using attractively priced hedges (that's the black magic). 7. There are plenty of would be predators on the Times. The Sulzberger family must be exceptionally receptive now to a bid at say $20, under $3bn for the Boston Globe, the Times, the NYT building, a stake in the Red Sox and other sundry assets. Compare last year's $10bn valuation for Facebook or $5bn for Dow Jones. Things change.